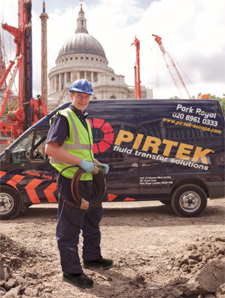 Pirtek has franchisees covering the whole of the UK and Ireland and all sales are resales. Please see the resales section. Pirtek started operations in the UK in 1988 and now dominates the UK on-site hydraulic hose repair market with over 90 Franchise Centres around the UK and Ireland. This year's net sales will exceed £65 million, making Pirtek by far the largest operator in the sector. Pirtek's product selection criteria is extremely high. Each manufacturer must meet international standards for quality, reliability, performance, technological innovation and product support which includes research and development, training and technical literature. The business is exciting with ever changing opportunities and demands. Challenging projects, people contact and a healthy profit potential ensure that the business retains its interest. Pirtek operates as a well supported business format franchise together with Licensees who acquire the rights to own and operate one of the Pirtek Centres in various regions of the UK. Each Centre is owned and operated by the individual Licensee within the proven guidelines which have made the Pirtek formula successful not only in the UK but also in Belgium, Germany, Holland and Ireland as well as Australia, China, New Zealand, Singapore, Southern Africa and the USA. Pirtek Licensees come from many walks of life, from banking to sales and marketing backgrounds, from industrial managers to marine engineers; few if any have specific hydraulic training, although a general industrial background can be helpful. Pirtek provides an on-site service for many of its customers; this service often demands quick response for the crisis situation. There is a second side to the business which develops increasingly as the business matures. The Pirtek Centre becomes a provider of a wide range of hydraulic and industrial products to end users in locations, such as plants or factories. This part of the business is not driven by the same urgency as the field service work. Pirtek UK is a national distributor for its franchisees who purchase their products on a monthly, weekly or sometimes daily basis. Each franchisee is a regional distributor and sells those products to its own customers. It also sells its services, call out fees and labour. Pirtek's main product suppliers are from Italy, a country which is well known in the marketplace for the highest quality. Italian companies supply products which are constantly at the forefront of technology, mainly through the extensive research and development programmes the companies have in place. It also includes the Pirtek IT Service Management System which is purpose built for the task and includes stock management, real time customer billing, as well as remote sales and service management. First year turnovers usually range from between £170,000 and £200,000 and grow to £500,000 in the 3-4 year period. From time to time established Pirtek franchises are put up for sale and the opportunity may exist to acquire an ongoing business in an established area. The cost of opening a Pirtek Centre is normally around £220,000, of which Pirtek can organise financing for two thirds. This means the prospective franchisee needs to have liquid capital resources of around £70,000. For this the franchisee will start his business operating from a 2,000 sq. ft warehouse. The Centre will be fully equipped with the plant and machinery required for manufacturing hose assemblies. A typical Pirtek Centre starts with three mobile workshops, fully fitted out to do over 90% of the jobs and of course a start up stock of products.